Here we go with another gorgeous neutral base with contrasting shimmer! 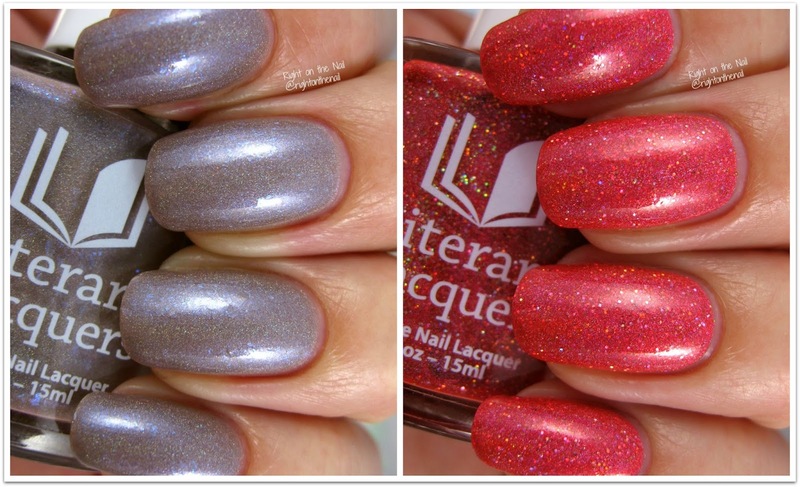 A Thousand Different Strokes of Light is the Book Club LE for the month and it is a light taupe with strong blue shimmer and a holo finish. My pictures don't do this one justice because this one just glows on the nail. The formula was slightly thicker than my personal preference. I didn't need to bust out any thinner or anything, but it was on the thicker side. I have extremely curved nail beds and I think that has a little to do with it. I checked with Amy from Literary Lacquers and she mentioned that the blogger batches weren't thinned at all and that all orders will have a little thinner of a consistency than what I was given. In other words, you shouldn't have any problem with the formula. I used 3 really thin coats for my swatches, but with a thinner consistency you will likely need just 2. This one gets an A+. Unspeakably Desirable is the Birthday LE and these bottles will be numbered. It's an eye-searing coral base with gold, red, and holo microglitter. It doesn't dry textured, but you'll still need a little extra elbow grease if you don't use a peel-off basecoat. The formula was similar to the one above, but I only needed 2 coats for this one. Again, you can expect a thinner consistency than my bottle. Perhaps this one deserves an A++? I don't know which I love more. Which one catches your eye? When in doubt, buy them both! Don't find yourself feeling the FOMO after September 8th. Don't worry, the returning polishes will be sticking around from now on. The shimmer and creme polishes will be for sale at $10, while the multichromes/holos will be $12. To learn more about Literary Lacquers, check out their website, Facebook Group, Facebook page, and Instagram.